Rediff.com » Movies » Will Aarakshan draw in the crowds? Will Aarakshan draw in the crowds? On August 12, Prakash Jha's latest film Aarakshan -- centred on the much debated caste-based reservation system -- will open in theatres worldwide. After his last product, the well-structured Godfather re-hash Raajneeti, proved to be an outstanding performer at the box office, Jha has yet again assembled an army of extraordinary superstar-actors: Amitabh Bachchan, the fiery Deepika Padukone, the ever-reliable Manoj Bajpai, an unusually sombre Saif Ali Khan and the naturally gifted Pratiek Babbar. The well marketed film was promoted at the recently-concluded Naya Film Festival, where a 15-minute preview was unveiled to the press. Jha later took questions. A film on one of the most controversial policies of the country may not be to everyone's taste, but it could create informed public opinion if given a chance. Not surprisingly, though, it has inspired protests from a number of groups, one calling itself the 'Anti-Aarakshan Group', the Brahmin Sabha, some pro-Dalit groups, and even Maharashtra's public works minister, Chaggan Bhujbal. Jha says most of these groups have their own agenda. None of them have asked to see the film. "How they can be offended without even watching the film is beyond my understanding," he says. As for the content, he says modestly, "I have tried to weave a nice, emotional story with my little intellectual resources." The film's plot has Saif Ali Khan, a college professor, romancing a sultry-looking Deepika Padukone. They break into vibrant song and flirt -- where else, but in the library. We take a look at the 15-minute preview: Amitabh Bachchan is Prabhakar Anand, the disciplinarian college principle and also Deepika's father. The rule-adhering, law-abiding headmaster is astonished when Saif accuses him of being casteist for overlooking the fact that another teacher, belonging to an upper-caste, is running a parallel coaching centre. Enter a sinister-looking Manoj Bajpai who spouts some menacing dialogues. India vs India, the film's tagline, is literally played out on screen. Deepika is torn between her father and her boyfriend, and her father is torn between idealism and reality. Saif Ali is at loggerheads with the entire system, particularly Manoj Bajpai, and even once-close friend Prateik. As the story progresses, Amitabh Bachchan's Prabhakar Anand takes a daring detour. He offers to educate under-privileged children for free in order to make peace with himself. The drama is well handled, a skill Prakash Jha has mastered over the years. 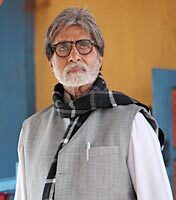 Bachchan gives a career-redefining performance. Saif is calm on the outside, but aggressive from within. In the one or two scenes where we get to see him, he looks affected although he seems to struggle to speak shudh Hindi. Deepika tries hard to blend in with the veterans. Will the film attract the big crowds when it releases this month? Let's wait and watch.